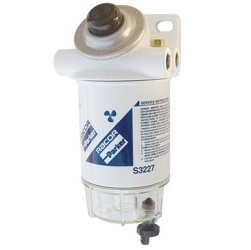 Racor 490RRAC01 gasoline spin-on filter is designed for high performance applications and with a flow rate of 90 GPH, your engine will perform better than ever with clean, water-free fuel. Its hand (palm) operated fuel priming pump simplifies servicing procedures and yields extremely low flow resistance due to its unique pump bypass characteristic. The 490R-RAC-01 features a high capacity Aquabloc II filter element that removes sediment down to 10 micron. The spin-on filter design is simple to replace and the reusable, see-thru contaminant collection bowl features a self-venting drain for removing unwanted solids and water. The mounting head is anodized and coated with a durable electrostatically applied white powder coating for superior corrosion resistance. That’s the quality you’ve learned to expect from Racor. Description found on Racor-Parker website. Click here to be directed to this products page.